Bubble Brawl is a 4-player minigame in the Nintendo GameCube game Mario Party 7. The four players stand on the play-field as water suddenly appears to fall down onto the players. When that's done, the water starts to form a bubble as it captures all the players there. 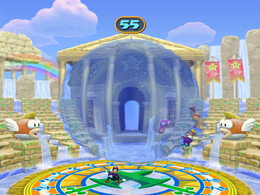 The bubble hovers from the ground after forming as the minigame starts. The players attempt to knock each other around outside the bubble. The players can knock a player by punching them. Players also can swim around the water bubble to try to avoid being punched. One trick to avoid being forced out of the water bubble, is to try to stay in the center of the bubble. The last player who is left inside the water bubble wins. However, additionally if there is no sole winner in 60 seconds, the players who are left standing all win. The minigame background takes place in some type of temple. The sky is crystal clear in the day and there is a rainbow in the left side of the sky and tow flags at the right side as minor backgrounds. Waterfalls additionally appear as the water from them moves down into around of the center of the water bubble. Water also moves down from the stone staircases. There are also two Cheep-Cheep statues that spit out water. The camera zooms in on the winner(s) as they do their victory animation. Rules – "Punch your rivals to force them out of the floating water bubble." Advice – "To avoid being forced out, try to stay in the center of the bubble." This page was last edited on January 18, 2018, at 14:19.